MADRID, Spain - After a 31-year hiatus Bultaco motorcycles has announced its return to the market with electric propulsion for its machines starting with the Rapitán. Montesa motorcycles was formed in 1944 by Pedro Permanyer and Fransico Pac Bulto. Permanyer and Bulto's relationship soured after a disagreement over road racing. Bulto broke away from Montessa and on March 24 1958 Bultaco held its first media conference and launched its first bike. Bultaco says its values today are the same as when it was founded - innovation, passion and competition - and the first models will have an advanced battery propulsion system. The project will create 500 jobs in Spain, directly at its innovation centre in Madrid, plant in Barcelona, or with suppliers. Advanced technology was developed in-house. Bultaco said it would stand out for its advanced technological solutions and the company was offering motorcycles with their own disruptive technology. It would become a benchmark internationally along with future developments in electrical and hybrid traction and ultra-light materials. The first battery Bultacos will be built in 2015; the prototypes are a peek at the motorcycles we will see in the future. Juan Manuel Vinós, CEO and co-founder of Bultco, said: “What began as a thesis project has become a company with the size and solidity needed to create a new generation of Bultaco motorcycles. We were not looking for a prestigious name for a promising project; it was something different. Bultaco’s outlook from the start - its spirit of constant striving, its technological innovation and its passion for motorcycles - are as today. They are timeless." The new generation of Bultaco, the company says, will attract two kinds of customer; aficionados who love the sensations they can get only from a motorcycle, especially ones with a certain level of features, and people with a positive attitude and an interest in 21st-century solutions for integrated mobility and connectivity. 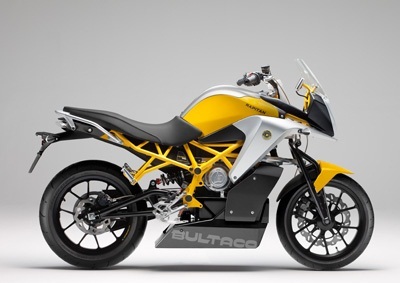 To reach these clients Bultaco says it will create a sales network, initially in Spain, the US, the UK, Germany and France. Bultó jnr said: “My father always said the ideal scenario would be a constant-torque engine with the same response as any system for a motorcycle without gearshifts."